How did medieval people deal with a king’s body when he died far from his intended final resting place (boiling or embalming?) What part did women play in commemoration? And what did royal tombs look like 800 years ago? Reading historian Professor Lindy Grant tells us about a recent conference on Royal death and burial focused on Reading Abbey, where King Henry I is buried. A real effort of the imagination is required to see the past glory of Reading Abbey in the battered remains surviving today. But Reading Abbey was founded in 1121 by King Henry I of England, youngest son of William the Conqueror, as his intended place of burial. Reading Abbey was one of the great monastic institutions of Europe in the middle ages – an intellectual and cultural powerhouse, with a magnificent church and richly decorated monastic buildings, a great library (King John kept his books there), and international connections. The Abbey’s monks were drawn from the order of Cluny Abbey in France, linking Reading to the Cluniac network to which many great churchmen, including popes, belonged. Its most prized relic was the hand of St James of Compostela, given by the Empress Matilda, King Henry’s daughter. This made Reading part of the elite group of medieval religious institutions with remains of the Apostles of Christ. The Abbey was the setting for various royal marriages and burials into the later Middle Ages, continuing the close connections between the Abbey and the English kings, first established by Henry I. 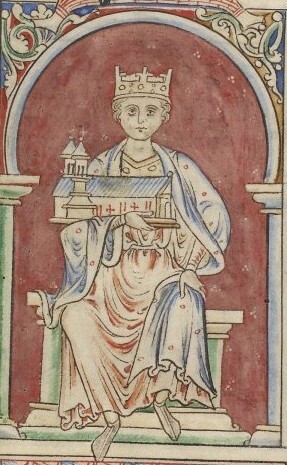 The kings and their family and entourage stayed often at the royal house adjacent to the abbey, and occasionally parliaments were held in the abbey itself. Our recent conference aimed to set the medieval abbey in its proper international context, concentrating on its role as a royal mausoleum. Several themes and parallels emerged. How did one deal with the remains of a king who died far from his intended place of burial, like Henry I and St Louis? Henry I was eviscerated and then inefficiently embalmed, while St Louis was boiled. How did these regal families balance dynastic and familial imperatives? Was the mausoleum intended for members of the entire family, as at Reading, Westminster, Fontevraud, Las Huelgas, and Batalha, with children buried alongside kings and queens: or was there an intended focus on the ruler and lineage, as at Saint Denis and the mausoleum of the counts of Champagne at Troyes? Women often played in important role in commemoration. Marriage bound dynasties together, and the prestige of a princess of impressive lineage, such as Leonor, queen of Castile, daughter of Henry II and Eleanor of Aquitaine, was celebrated in her tomb. Eleanor of Aquitaine made Fontevraud the mausoleum of the Angevin family: Blanche of Castile, Queen of France and Eleanor’s granddaughter, developed Royaumont as a private, familial space for the tombs of French royal children. As for the tombs themselves, as at Reading and Troyes, so much has been lost, and has to be approached through antiquarian drawings. Only by the later 12th century had it become fashionable to have an effigy of the deceased on the tomb chest, and a rich variety of materials were used – painted stone, marble, bronze and enamelled metalwork. The innovative quality of tomb design in Iberia and in Champagne – places which might be thought more peripheral than the burial houses of the English and French kings – was striking. Whatever the ruined reality of Reading Abbey on the twenty first century, this conference reminded us of its status in the middle ages – as one among a small and elite group of prestigious religious institutions in Europe which housed and commemorated the remains of kings. ‘Royal Death and Burial: Reading Abbey in Context’, held on 6 April at Reading Town Hall, was a collaboration between the University of Reading, Reading Museum and Reading Borough Council. Lindy Grant is Professor of Medieval History in the Graduate Centre for Medieval History at the University of Reading.